You are here: Don't Waste The Crumbs » Shopping & Sourcing » Which is Cheaper Costco or ALDI? Which is Cheaper Costco or ALDI? Costco is known for their great deals on real food because you’re buying in bulk. ALDI is known for being for having incredibly low prices thanks to their private label and lack of variety. So which is cheaper Costco or Aldi? Readers have left comments saying they cancelled their Costco membership because they found better prices at ALDI. I’ve also heard other readers say the opposite, that Costco beats out ALDI prices every time. But still, are they lower than Costco? I hit the streets this past weekend to find out the answer. 1. Compare the most purchased items. I compared the same items that I purchase every month, over and over again. Yes, you’ll save a few pennies on the onsie twosie items too, but you’ll find the biggest savings when you find rock bottom prices on the items you repeatedly buy. 2. Staples only, no produce. The price of produce alone will vary greatly from region to region, and season to season. For this reason, I chose to not include it in this comparison post. 3. Prices are still regional. The prices below are taken as of 4/22/2016, are from the Atlanta, Georgia area and should be used as a guideline only. You may or may not find the exact prices in your area, so do your homework before you commit to one store or another. 4. Use the lowest per unit price. Some items are offered in ounces, some in pounds. I broke it down to the lowest price per unit that is common between both items. Shopping at Costco means having to buy in bulk in order to get that price. There is no option of buying just one single item. Shopping at ALDI means buying individual items for the price listed, and you can buy more if you’d like. I tried to compare the exact same item whenever possible, like organic peanut butter to organic peanut butter, in order to keep the playing field fair. If I couldn’t find an equal counterpart at the other store, I didn’t include it in this post. The only exception to this is raisins, since it’s a popular item in many kitchens. But I also think the fact that one was NOT organic is why that store was the winner. ALDI has their own private label just like Costco does, so for the purpose of today’s post, I ignored brand names. I did check ingredients though, and everything listed below is 100% real food. Note: Items are listed in alphabetical order. Of the 27 items I compared, only 7 were cheaper at ALDI. Now, that’s not to say ALDI is “expensive” – oh no, it’s still very affordable. But when you think about the specific items you buy on a monthly basis, you’ll save more if you shop at Costco instead of only shopping at ALDI. Curious if ALDI can beat out Walmart? Check out this comparison! If everything above was on my shopping list, and I could only buy the quantity offered at Costco (just to keep things consistent here), I’d spend $289.53 at ALDI. If I bought these same items at Costco, I’d spend $212.85. You’ll save $76.68 (26%) by shopping at Costco instead of ALDI. Considering my grocery budget is just $330 each month, this is tremendous savings! I don’t have enough wiggle room to toss aside $75+ dollars each month – do you? Of course this lesson should be applied broadly to your own shopping routines. Do you often shop at one store for convenience instead of another that you know costs less? Or maybe it’s Publix versus Kroger. I have no doubt that if you took an hour to list the top 20 items you buy every month and compare prices side by side at each store, you’d be amazed to see how much money you could save by consistently shopping the more affordable store. This is one of the principles I teach in Grocery Budget Bootcamp that’s helping families save hundreds on their groceries every month. Shopping local is sometimes preferred, but don’t forget that online shopping can help you gain amazing savings too. Do you shop at Costco or ALDI? What are the top 5 items you buy at each store? 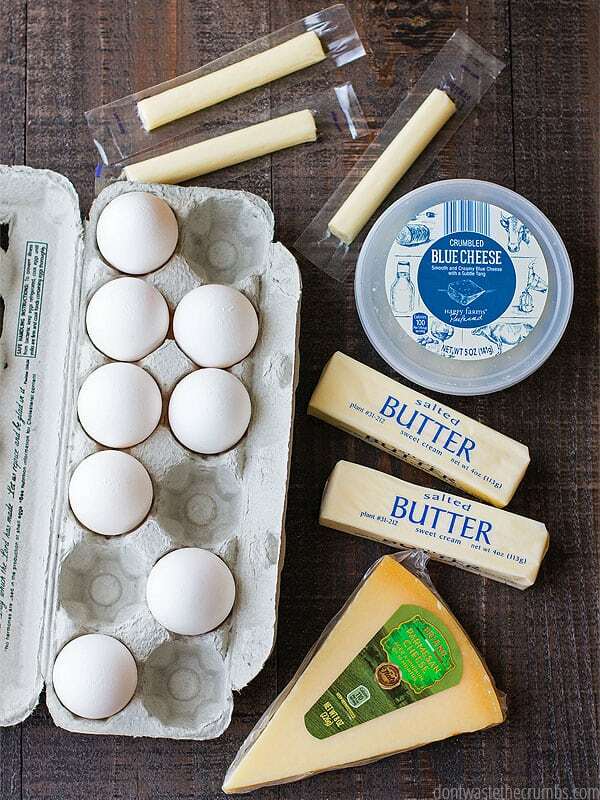 Double check your blue cheese winner. I think it should say Costco. How do you rationalize the Costco membership fee? I don’t have one. I comparison shop between Aldi and Kroger. I stock up when I find an awesome deal at Kroger. Yesterday I bought name brand butter for $1.99 with coupon and plan to buy more at $2.49. Next week cheddar cheese will be $2.50/lb. Those are staples I use every day. Milk has been crazy cheap ($1.49-$1.69) at my stores for over a month. Another blogger recently bought Lindsay Olives for $1.2x at Costco. They are another staple. I bought some yesterday at Walgreens for $0.99. It seems to me that the membership would take a long time to pay for itself. Note: my Costco is a 60-70 mile roundtrip, so nearly three gallons of gas has to be factored into each trip. You have an excellent point, Amy…however Costco membership is $55/yr. That would be recouped the first month with a little over $20 to spare. In the course of a year, we’re talking about a potential of $845 in savings. As for the gas…at roughly $2.50/gallon (makes the math easy + these low prices won’t last forever), you’d still be saving about $67/month, or about $750/year, net of membership. If you don’t have time for the 60 mile round trip that is a different reason, but just as legitimate. I choose to make the nearly 40 mile round trip twice a month because it is so convenient to buy the bulk of our groceries all at once. Then I can go to Sprouts (southwest grocery chain) weekly for the rest of our needs. We don’t have an Aldi nearby, and last time I price-checked, Kroger and Tom Thumb were more expensive in the items I needed. Thanks for doing this math for me Kathleen, and sharing your experience driving a bit further for Costco! Thanks Amy, fixing the post now. As for the Costco fee, it’s $50 (for me) every year. If I’m saving $75 each month, the membership fee is paid for right there. Over the course of a year, I’m saving $800+, and that INCLUDES the fee. My husband and I have the Executive Membership, which is $120. The Executive Membership, however, gives a 2% annual reward on purchases, so we recoup that during the year between groceries, gasoline, tire purchases, any big home purchases that have to happen, etc.. I think it’s worth it. For me, the biggest factor is the bulk buying at Costco. If the larger quantities work for you, don’t let the membership fee deter you. If you choose the more expensive Executive Membership option, you get a percentage of your purchases in cash back at the end of the year. For my (extended) family, that cash back more than equals the total membership cost. My extended family uses the same membership, so all our purchases count towards that total. True and good points across the board Mary – thanks for sharing! A word to the wise about bulk purchasing and pricing: I worked closely with an organization setting up a food pantry and seeking donations from a “big box” store known for large-packaged and bulk items. This “big box” store which markets these purchases heavily, wouldn’t donate large (26 oz) jars of peanut butter but only small (14 oz) jars. They explained their reasoning thus: “If you give people a 26 oz jar of peanut butter they’ll eat like they have a 26 oz jar of peanut butter. If you give them a 14 oz jar they’ll eat like they have a 14 oz jar.” Point being if you have a larger size or bulk item you might use more (which is what they are banking on with the lower prices). After learning this I started paying close attention to our consumption and decided to no longer “stock up” beyond a couple of weeks or, in the case of great meat deals, about a month or 6 weeks. For our family, we have saved more money NOT buying in bulk, even if the per-ounce cost is a little more. I think there is something to this idea. I go back and forth because it’s tempting to stock up on bulk when the cost per ounce is cheaper, but a lot of times not buying in bulk has been a budget-saver. This is interesting Rosa, and I agree to an extent. For our family, I try to buy in bulk the foods I know we’re going to eat a lot of anyway. But making one trip each month helps to off-set us eating more than what’s budgeted for the month. When it’s gone, it’s gone! Rosa, I was going to comment with a very similar sentiment. If we have the “family size” box of cereal and the huge tub of coconut oil, I’m much more mindless about how much I divy up per serving. But with smaller package sizes, I am aware that it needs to last for a week before grocery shopping day rolls around again! For this reason, Aldi is much cheaper for our family. When we buy in bulk. Anyway, that being said, I’m so glad you published this list! I’m definitely going to take a closer look before I hit costco next time. I think there are some things I could get there instead of Kroger/Publix that would be a better deal. Thanks! You’re most welcome Diana! As for the produce, we’re VERY selective about what produce we buy in bulk. If we buy spinach, I make sure to have several dishes that use spinach on the menu for the first few weeks, then make plans for the rest before it goes bad. Same for lettuce too. But onions and potatoes can last, and both of those are cheaper at Costco (although I still recommend looking locally first!). squeeze the air out. I use it in anything I intend to cook. I have a family if give and our food budget is $450 a month. We only sop at Sam’s Club and Aldi. With a little comparison, I think you can shop the best of both stores. I have learned however that we tend to spend less when we carefully choose what we buy in bulk. While you might get rock bottom prices in bulk, if you spend only a few cents more for the single item that you need, you actually save money overall. I agree Sarah, especially if it’s not something you need a lot of right away. 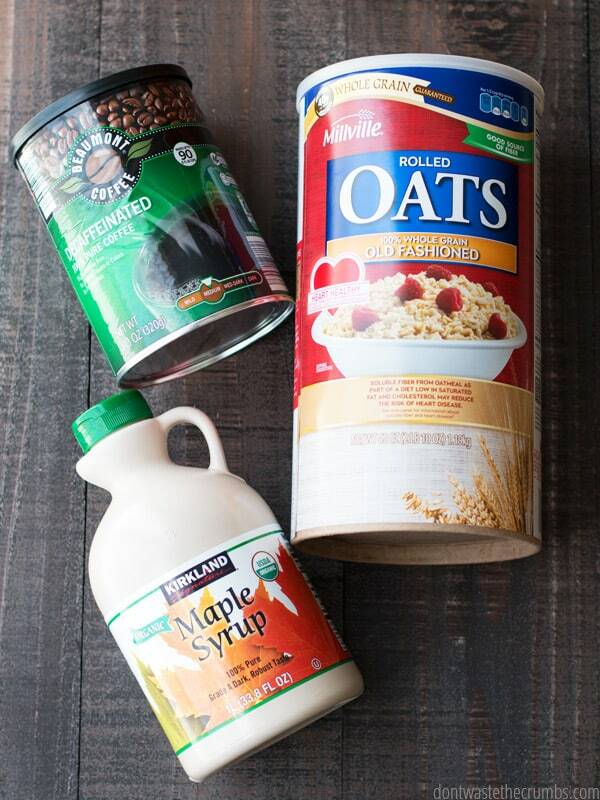 There are a few things we always buy in bulk because we eat a lot of it, like oatmeal and flour. But other things we might not necessarily need much of this month, so I’ll buy a smaller package to save room in the budget for the bigger items. I’ve been pondering renewing our Costco membership (we don’t have ALDI here) and this was really helpful. The nearest Costco is an hour away so I have to factor in the cost of gas as well, but I appreciated seeing the prices broken down. Thank you! Take off the membership fee. In the end I disagree. Costco and SAMs do you really need NEED 50 pounds of something? And the stale factor on that bag of whatever? Even like eggs. Go for it with five dozen eggs. Bottom line cheaper. Waste factor no thanks. Hi Bridget! Even with the membership fee, you still save over $800+ in the course of a year. And you’ll recoup the cost of the fee the first month. with 4 boys and a husband, we need bulk sizes of everything! An 8 pack of tortillas from a regular store doesn’t cut it for one meal, pretty soon one pack from Costco won’t even do the job! Amen to that! I have two boys and expecting another baby, those boys eat and eat and eat! Hubby eats the least of everyone haha. Interesting! But it’s aaaaaalllllllll cheaper than those items in the greater Seattle area (except for the mozzarella). 🙁 I’m a sucker for the posts that say “See how I feed my family of nine for three dollars a month!” (or whatever), and it’s just become a sad reality that the cost of food up here is higher. Just flat out more money for the same food. Love my Costco though! Where you live definitely plays a part in how much you pay in food Katie – just do the best you can with what you have! If I bought 16 ounces of vanilla (costco), I would be throwing away 15 ounces of it. I’ll definitely need to use my list. Gosh. That list is longer than I thought it would be. And I’d totally buy the eggs if I had a place to store them. We eat at least a dozen at a meal for the five of us. I seriously need to do some research on this. I’m from Canada and the cost of food is much higher up here. That being said, with careful planning, we always recoup our executive membership at the end of the year. With a family of 5, we purchase all our staples at Costco and shop sales for the extras. That’s exactly what I thought when I saw the comment about $1.49-$1.69 milk. I live in rural Saskatchewan, Canada, and a gallon jug of milk is $6.49! I think it’s around $5 at Costco an hour and a half away, but with four kids, we go through a jug every two days if not sooner. I would be curious to see a produce comparison even though I know it is seasonally priced. I mainly buy produce from Aldi (when it looks ripe) and the grass-fed beef, plus any good sale items we find. We don’t have Costco in my area, but there is a Sam’s club. Are the prices similar between Costco and Sam’s? I think they’re similar enough Amyp, maybe some slight variations in brands and sizes, but I don’t think you’ll find a huge difference in price. I’ll keep in mind the produce – it would be helpful for at least the staples ones like onions, potatoes and garlic! The biggest comparison comes from the membership price. Cosco’s basic is $55 where Sam’s is $45 and the Executive at Cosco is $110 where again Sam’s Plus is lower at $100 and with Sam’s you also get cash back at the end of your membership year – $10/$500 spent for a maximum of $500/year. There are also other perks to a Sam’s plus membership and I’m sure there may be with Cosco too, you would have to do research on that. Kellie – do you think it’s a wash though? Because Costco offers cash back too, and if you don’t get back that extra $55 you spent to upgrade your membership, they’ll refund you the difference. While we don’t have a Costco membership we have a Sam’s because it is free. We do buy a lot of bulk items there. Some of the items we purchase at Sam’s is on your list and they are just as cheap at Sam’s. Some items it doesn’t pay us to purchase there. We also have a 1 hour drive to get to the nearest Sam’s from us and it is worth the drive. We make a day and do a lot of our other shopping in that area of town (Aldi is down the road) so we can hit both stores at once and get everything we need. I just started shopping at Winco. The prices are generally cheaper than the Freddy’s, Haggen’s, QFC, and Safeway in the area (near Olympia, WA). There is a Costco only a few blocks away from the Winco, but I don’t really know how to price check because I don’t have a Costco membership. Has anyone had any experience comparing those two stores? Amber, we have both in our area–Winco is about 5 miles from me, Costco, where I regularly shop, is 15 miles further. I haven’t gone in to both stores with a price comparison sheet but I did take mental notes when at both in the same week–they are about the same for things like Tillamook cheese and paper goods. However it would simply depend on what you buy as to which is cheaper. Costco carries organic chicken and beef. Our Winco doesn’t. Same with organic corn chips. Plus Costco carries organic frozen items, butter, meats, pasta, flour, etc. The produce seemed a little high to me at Winco–because I go to Sprouts. However the coffee beans and Winco are hands down the cheapest around! If you want to compare with what YOU buy–which is far more relevant than anyone else’s experience, you can often “sneak in” to Costco by going to the pharmacy or the liquor department. Or see if a friend will let you go with her. Or, buy a membership. If you aren’t satisfied, they’ll refund your money, no hassle. Amber, go to Costco and say that you are thinking of getting a membership. They will let you tour the place and price shop. Take pics with your phone. That is what I do. Then come home and calculate it out. I get the bigger membership….I think it is the executive. I split it with my in-laws. I said that my father-in-law was my husband on the application. As long as my family doesn’t care that it looks like I am a gold digger or my father-in-law is a cradle robber, we are good. LOL! I get 2% back from ALL purchases made from my account in the form of a Costco check. Last year we paid the $110 and got back $78. So that means, we only paid about $32 for our membership for 2 households. Plus, we go to Costco weekly. The prices of produce are cheaper and we go through a lot. We also buy La Croix there. If you aren’t aware of La Croix, it is sparkling water and pretty pricey. Our Costco has 30 cans for $8 where it is $4.50+ at Meijer or Target for only 12 cans (not on sale). We also have Sam’s Club. We are members there too, but it’s free from my Mom every year. We only buy a few things there now and make a trip inside about every 2 months. The Costco nearest to us allows anyone in- you just have to have a membership to buy something. We have a Sam’s club about 20 minutes from our house – Costco is about 45 minutes away. I went to both recently, trying to decide which, if either, to get a membership for. I found Sams club had very few of the items I was looking for. Costco had many more items on my list. A friend also told me that the produce she buys at Costco lasts much longer than produce she buys at the grocery store. Anyone else noticed this? I have found that my Costco produce is usually more blemish free, which allows many of the fruits to last longer at home. Occasionally I have trouble, but their return policy is fantastic. I love aldi 🙂 Costco here in wny at least not close to me 🙁 we have sams club, bjs and restaurant drop, (Wal-Mart and tops and wegmans and save a lot for groceries) I’ve compared prices multiple times on items I normally but and aldi is almost always cheaper and better quality. I get coconut oil and olive oil and organic sugar at Wal-Mart cheaper. And dried beans rice at restaurant depo. My fav things to get at aldi are chocolate chips, almond milk, cheese, frozen veggies, and chicken sausage. And peanutbutter but we dont get the organic kind. Oh and gluten free pasta. badly for all the ladies that don’t have choices for grocery stores. Where I live I have Trader Joes, Costco, Sams Club, Walmart, Target, Aldi, Fresh Market, Jewel, Meijer and an independent store called Blue Goose all within 5-7 minutes from me. Mariano’s is about 25 and Whole Foods about 30. Don’t forget their super cheap prices on shampoo and conditioner, contact solutions and deodorant, stuff like ziplock bags, foil and plastic wrap. Also they have the BEST customer service that exists. They will take back anything. Their produce is more expensive than Grocery Outlet, or sales at other stores, but is still reasonable, so if I don’t have time to go to other stores, then I buy it at Costco. As for bulk shopping, I absolutely know it saves money. The worst thing for me is when I run out of a staple and am in the middle of a recipe and run to the nearest grocery store and pay twice what I should. This happens a lot less to me when a bulk shop. I make my own bread, but when I don’t have time, their bread is super cheap too. Thank you for this post…and all of the comments have been great food for thought, too. I’ve been tracking this stuff in my head lately, but I really think I need to make my own list and price check a bit. My shopping habits and our eating habits have changed just enough in the last year, that I should quickly reevaluate the items that we most often buy. I do this every 6-12 months, but am overdue. My list would be similar to yours, although I noticed a few items where the prices would be different, resulting in a different “winner”. We have many stores nearby, so I usually shop Costco once a month, Aldi 3-4 times per month, and fill in with loss leaders at other stores when I pass them (including the occasional stop at Walmart to price match). I really need to look at the price of nuts, since I’m surprised by your results and we’ve been eating more of them lately (plus they are a higher cost item to start with). Thanks so much for getting me thinking…and hopefully acting on the information! I had to get back on and post another Thank You! I put together a list of about 25 of my most common and/or expensive grocery purchases, then got my local pricing for Aldi and Costco. Based on your prices, I knew that I was going to be surprised and the “winner” for most of my items. Sure enough…I will be changing my “go to” place for a number of these items. I think I’ll add a few items to my list here and there, too. I have also been buying some items from Amazon Subscribe and Save, so I priced a few of those from Costco. Now, I’ll be able to actually check the price the next time an Amazon deal comes around, instead of just thinking that it’s a great deal. Wow! What a comprehensive comparison! We have both Costco and Aldi nearby, and I have been shopping both for quite awhile. Did not realize that there was such a difference in the prices of some items! Thank you for the info! But I have a couple of thoughts that might change the overall conclusion. First, I think there might be a potentially significant error in your calculation: you listed flour at Aldi for $1.39 per POUND; are you sure that wasn’t supposed to be for a 5-lb bag? I just bought a 5-lb bag at my local Aldi for something in the range of $1.39, and even in our higher priced grocers, a 5-lb bag is rarely more than $2.00. If you calculated the cost of 25 lbs of flour using $1.39/lb rather than $0.28/lb ($1.39/5), you added more than $27 on to the Aldi bill. I’m also not sure it is really accurate to suggest this would be a monthly savings. This is the first post by you that I have read, so I’m not sure exactly what your family’s typical eating habits are, but I know for my family of four, the Costco quantities would definitely be more than a month’s supply on most of the items. For example, a 2.5 lb bag of almonds would last us about 3 months, and 16 oz of parmesan would probably be 6 months-worth for us. I have a 5 oz bag of dried cranberries in my pantry that is at least on its second month, and I know that a pound of blue cheese would go bad before we even got close to finishing. And 8 pounds of pasta is 64 servings — or 16 meals for a family of four — so that is easily 3-4 months worth of spaghetti. Ditto on the 25 pounds of rice! So instead of seeing about $800/year in savings at Costco, it is realistically more like $150-200 over the course of the year on the items you listed, and that is before you deduct the cost of membership. Still a nice savings, but probably not enough to make it worthwhile to make a big change to one’s shopping habits. I’m definitely looking forward to reading more of your posts! I was thinking the same thing about the flour! This would drop the monthly savings from $76.68 to $48.18 (accounting for $28.50 in flour). Still a lot of money to be saved at Costco. This whole article has me thinking about renewing my Costco membership again. I let it lapse when I thought Aldi would be cheaper. Thank you, Tiffany, for running the numbers for the rest of us. Hi Cassie! I’m just now seeing this and you’re right – the price for the flour should be a 5lb bag. I’ll correct the numbers! I think our families eat significantly different because this truly is close to a monthly savings for us. We easily go through a container of cashews, 16 oz Parmesan and blue cheese without batting an eyelash. I prepare one pound of pasta each week, which yields us dinner plus a few leftovers for lunch. Remember that these numbers are for MY family, so if your family eats differently it might not be worth it for. But I know that making Costco a regular stop at the start of each month has DRASTICALLY improved my budget these past few months! Thank you for this comparison. I’m horrible at impulse buys though and impulse buys at bulk stores are brutally expensive. The ALDI here in my town does carry a very good selection of items I normally buy. I usually drive 45 mins to my nearest Costco to do my staple purchases. We are a family of 6 so the less shopping I have do the better and less worry about meals I have to plan. So for me Costco is my win. But then if you throw TJ’s in there I shop both places. But my family mainly eats organic and Paleo. This is amazing! Thank you so much for crunching the numbers and actually justifying my desire to re-enroll in a Costco membership! You’ve got really perfect timing because I’m due to have baby #2 any day now, and my toddler somehow eats as much as a grown adult (well…almost). My biggest question is how do you survive on so little milk?! It’s kind of pathetic (and a really big expense!) But we go through a gallon every 2-3 days between my husband, toddler, and myself. It’s crazy! This is an amazing post. Thank you for making the comparisons. We choose to shop both places. I usually go to costco one week and aldi the next. I find that some snack foods for the kids are better to buy in smaller quantity. I also love the salmon from Aldi but I prefer to get eggs, milk, butter and cheese and costco. Your blog alays impresses me, you have a great selection of useful and helpful posts! Thank you, Tiffany, for the footwork, time, and desire to share what you found. We just recently joined a new Costc about 30 minutes away. I’m an Aldi’s fan and was a bit skeptical yet fascinated by what my friends would get from Costco. Thanks were even buying things for me, like the premium vanilla ice cream (one son is allergic to artificial food coloring) and gluten-free flour. I have to confess after buying from Aldi’s for at least 14 years, I had a bit of a sticker-shock when I checked out at Costco. But, i’m always learning! At least here, butter is a “flip flop” item . . . sometimes it’s cheaper at Costco, sometimes it’s cheaper at Aldi. I’d also be interested in whether the cheddar you compared was shredded or chunk? At our Aldi, shredded is actually cheaper, most places chunk is, I’m going to have to re-check that one at Aldi vs Costco. I did a comparison between Costco and Sams a couple years ago and, for what we buy, Costco was the same or better price on everything but white vinegar. My parents have a Sam’s membership so a few time a year when we’re visiting them or they’re visiting us, I have them get us vinegar (I use it for cleaning and laundry, so we go through a lot). I did the same comparison 9 or 10 years ago and Costco and Sams were pretty much an equal spit, with each being better for some of the items I bought. In that case, I opted for Sams because I owned my own business and Sam’s business membership was a better deal than Costco’s (or either personal membership). So, while my shopping needs have probably changed some over 8 years, I think each store has “specialized” more and Costco’s specialization leans more toward the whole foods and organics that we use. We dropped our Costco membership because a huge part of our weekly grocery list is fresh fruits, veggies and dairy. Even with 2 refrigerators, I cannot buy bulk everything for our family of 9 and have it fit in these two units. The bigger bags of cheese I buy, the more cheese the kids think there is for lunch when they are the lunch makers. There is one item we do not like from Aldi and that is the coffee. So for me with health limitations, getting in and out of Aldi every week in 20 minutes or less–hands down Aldi is a win-win in our home. We must not be buying the same items you are as we can our homemade jams, do not buy specialty cheeses, cannot afford organic and buy many items 4 times a year from a co-op that gives us free delivery for spending $400 at once. Interesting. I do almost all of my grocery shopping at Aldi and Costco, so I’ve comparison shopped them for staple items pretty carefully. 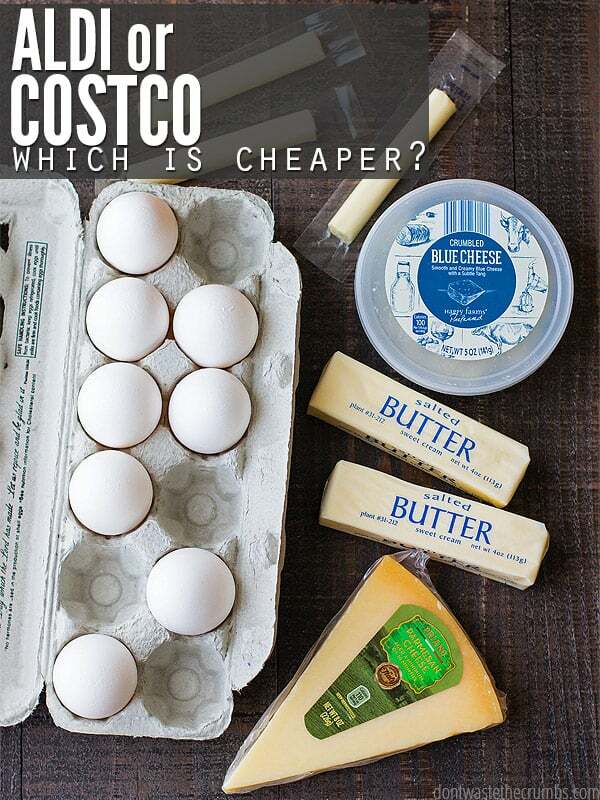 I’m smack dab in the middle of the country, and it’s been a couple months since this was posted, but one thing that stood out to me was eggs – awhile ago, eggs were split, Costco or Aldi might have the better deal, but for probably four months now Costco has been WILDLY cheap. Like, this week eggs were 1.09/doz at Aldi – still pretty inexpensive – but under 54 cents at Costco, in the 5doz pack! For our family of six, we eat a ton of eggs (like, we’ll go through three of those five-packs over two weeks), so that’s enormous. My comparisons do tilt more toward Aldi than yours do, though. Ground beef is $2.99 for 85-90% lean, as good or better than Costco. Chicken breasts are $1.89/lb, as is ground turkey. Produce is almost always cheaper, with a few consistent exceptions. I will be rechecking some of mine after looking at this list, though! The ALDI near me never has eggs for more than $1 a dozen and are usually 89¢/doz. There’s a BJ’s near me (across the highway from Costco) that sells 40 bottles of water for $2.99. I don’t know if you have already but you should compare BJ’s and Costco, so i know if i should change my membership. LOL! I plan on checking out BJ’s and Sams in the near future and I’ll share what I find! Unless it’s changed, BJ’s membership was significantly higher than Costco & Sams. I asked a friend, who had a BJ’s membership to check prices on some of the staples I get at Costco, and the prices seemed comparable, so I found it unlikely that I’d save enough to cover the higher membership fee. For things that I buy, Sams & Costco are almost identical prices in things both carry. I chose Costco because it has more organic options. The only thing I buy regularly that Sams is better is white vinegar (I use it for cleaning, so go through lots of it). My parents have a Sam’s membership so I have them get it for me when I run low. is .69 a gallon.. yes a gallon. eggs are .49 cents a dozen. ground beef is 1.39 lb. I can assure you that Sams club (we don’t have a costco) is not that low. Also sometimes and this is when I stock up at Aldi’s is when there is a sale. Last week chicken legs were .49 lb. I bought 6. But that week I won’t buy ground beef until it goes on sale. You still need to bulk up to save boat loads of money there.. I shop via their ads. then stock up. The other thing is if your looking for organic its usually a bit more but not 3 .00 more. Northeast TX. Food for thought. I always overspend at costco. Not intentionally. It just happens. I have learned not to browse but for example. If i buy the costco cheese sticks opposed to Aldi which are more expensive. I am spending more because my kids will inevetibaly eat more cheese sticks because they are there. If i had bought aldi cheese. It would be gone amd they would go without. So in this cae, cheaper for aldi. Or i coukd just remove the culprit of cheese sticks. But i find this with many things. The price per lb or kz might be less, but if you have more of it. It tends to be gobbled up much quicker and more often. This is my only problem with Costco. Its not their fault, but i spend more money per month just by shopping there. Even if its cheaper. Trying to get better at this. With eggs at 39 cents a dozen.. Milk is .79 a gallon. There is no way on earth I’ve ever seen these staples this cheap anywhere. With that said we still purchase based upon sales. If Aldi has it on sale for instance chicken for .49 lb.. then I do stock up. I wish I could tell you about costco but we have sams club. There are certain items I would choose to go to sams for but I only go about every 3 months and stock up.. We have a farm so meat, poultry, etc… is fresh from us.. I do want to tell you that since Aldi’s came here 1 year ago.. I can no longer sell my eggs, meat.. eventhough its organic people just don’t seem to be able to resist Aldi.. Our Aldi is the #1 store in the country.. Perhaps thats why the fluctuation in pricing..
Hi Tiffany — I shop Aldi mostly for produce! Do you think it’s worth it for us (it’s just my husband and I) to shop at Costco? What about BJ’s – that’s closer for us. Just wondering if you don’t have a family if it’s worth going to club stores. Thanks! I”ve heard so many good things about Aldi that I was bemoaning that there isn’t one here. This makes me feel better. In my opinion Costco is over hyped and they just went up on membership. The only one near me is a 45 minute drive and their parking lot looks like a wreck on the interstate. I’ll gladly pay a few dollars more to avoid the hassle at Aldi. I read where Sams came out cheaper than Costco, so how does this square with your comparisons. Gary – I haven’t had a Sams close to me until recently and I don’t have a membership there. Of my limited experience shopping with my mother-in-law, I’ve found that Sams does have good deals, often comparable to Costco, but that Costco’s selection of meat, produce and healthy options far beats Sams Club. I also love that Costco will take back anything for any reason. I recently bought some grapes and plums and when I got home, they were not tasty. I took them back and they refunded my money, no questions asked. That is a big perk! Aldi is even better, they have a double back policy. Meaning you get a new bag of plums and the cost of the plums refunded back to you in cash. I save every Aldi receipt until after we finish our produce, just in case. Since there are only two of us retired folks in the house, we choose Aldi. Costco is abt 65 miles away and in the big city. Our summer gardens and orchard provide us with about half of our yearly requirements. Thanks for taking the time to make the comparison!! I’ve always wondered how the two fared, side by side. It will be interesting to see what Lidl brings when they build stores in USA. They were Aldi’s competitor in Europe and we enjoyed their stores while we lived there. Have you tried Aldi’s salmon? That is a really great price! Canned salmon can sometimes be close to this price. It would be awesome to have a source of frozen salmon. I am pinning this list! Yes I have, and it’s good! Considering those that do not have a vehicle, like me, it would take almost 1 hour to get to a Cosco or Sam’s Club. There is a bus system in my town, so I go to a Save a Lot or Aldi’s or a GFS. For some who have absolutely no way to get there, buying a membership would be a waste. GFS is slightly comparable in bulk without a membership. You need to way the pros and cons. I agree that everyone needs to weigh the pros and cons – it wouldn’t make sense to buy a membership to a place where you were unable to get to!